Happy Holidays from the Hairmates team! We’re offering $10 off any service over $60 from now until Feb 12, 2017. Simply click on this coupon, print it out, and present it during your next visit! 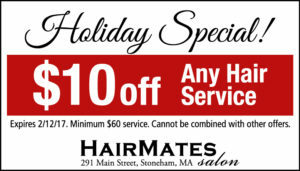 Holiday Special - Goldwell & KMS!